The story of wine is a story of enjoyment, delight and pure subjectivity! The subjective perception in drinking wine is of such a great importance like nowhere else. Especially when it comes to wine opinions tend to differ sharply. Taste can be as individual as wine itself. 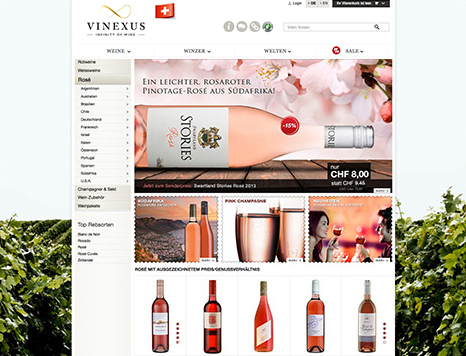 Vinexus as a big brand for wines all over the world would not commit a division of which wines are more or less better. At Vinexus you can find wines from the old world or from overseas, bargain or luxury wine, wine superstars or insider’s tips. At Vinexus everyone can find exactly the wine he or she likes best. Wines that we import on ourselves from around the world on pallets or single bottles of wines that are our particular favourites – we at Vinexus have it all! So you can be sure: With Vinexus you get any time your favourite wine at stable prices and you can always track alongside new recommendations and discoveries. However, of course we focus more on quality than on quantity. Therefore you will find only well known brands and real premium wines, no knockdown prices or randomized clearance sales. It’s all about good wine for all of us! We set standards in delivery time and customer service. When choosing our range of wines anyway. 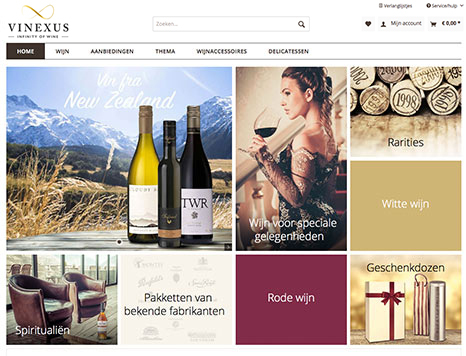 We guarantee: Vinexus has always simply the best premium wines. Due to our selective shop structure, short, simple ways and the lightning-fast, friendly and professional customer and delivery service everyone can easily find the wine he or she has always been looking for or looks for again and again. With us there are no restrictions but the infinity of wine! We’re happy to share with you our passion for wine! 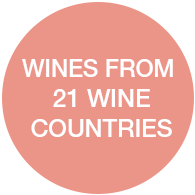 More than 6000 wines from around the world, chosen and reviewed by our taste and experience. At Vinexus everyone will find his or her most liked wine! Our team, always in direct contact with winemakers, importeurs and wine experts, guarantees the best and most professional wine range in Germany. We are known for our fast delivery. We mostly deliver within 24 hours. No one else is so quick. 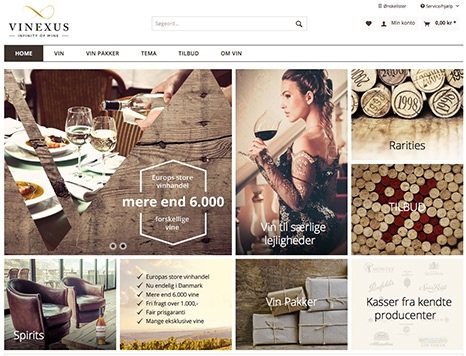 At Vinexus you solely find premium wines, well known brands and real insider’s tips. We offer you the highest quality in wine! 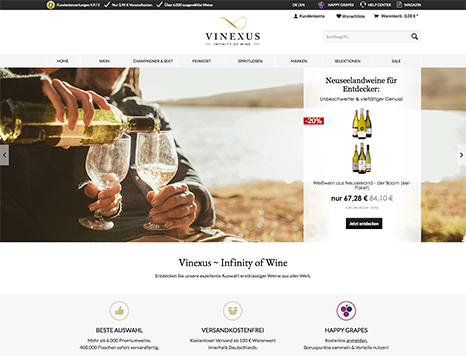 Discover with Vinexus the infinity of wine! Our wine selections offer selected wines at guaranteed fair prices. 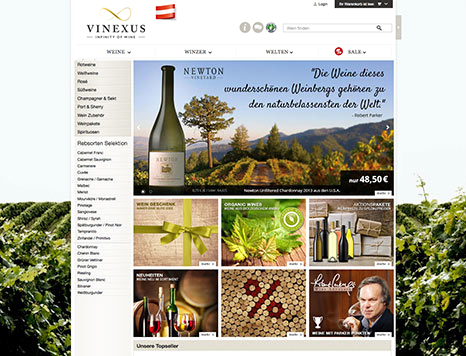 At www.vinexus.de you will find over 6000 premium wines from around the world, many details on the subject of wine as well as the unique “Wein-Infothek” which provides much information about the wineries we represent. 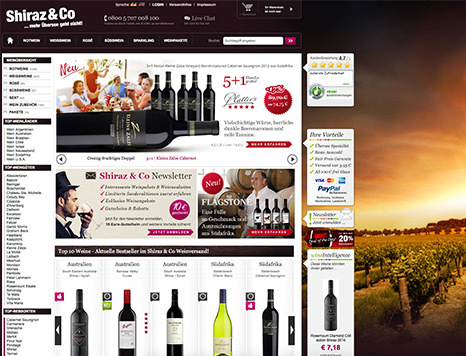 In our in wines from overseas specialized online shop Shiraz & Co you can discover wines from renowned wineries and also an exciting range of fantastic wines we distribute exclusively in Germany.